A plethora of research continually accumulates on a daily basis indicating how important the microbiome is for both gut and overall health. This, of course, has led many people suffering from health conditions or just looking to optimize their health to track down ways to promote a diverse, healthy microbiome. While this interest is certainly properly placed given the vast array of functions that the microbiome has an impact on, the way most people address their gut health and microbiome is fatally flawed. This approach is not uncommon in the health world and nearly always fails. Having worked with people for over 2 decades in the health field, 99% of people looking for a health solution are looking for the simplest, least effort approach to move the needle. This is clearly the approach most people are taking with the microbiome given the popularity of prebiotics, probiotics, digestive enzymes, and motility aids that have flooded the market. Unfortunately, for those addressing problems in this way, it’s also pretty clear that this approach doesn’t work over the long term…at all. The problem with this approach is that it’s too myopic. Just because you dump a probiotic in to your gut or feed the good guys with fiber doesn’t mean they’ll flourish in your ecosystem. In horticulture you don’t just grow a tomato in any soil and environment you wish. The environmental conditions must exist that cause that plant to grow, and that includes more than just seeds and some soil. Your gut is no different, and the environmental conditions that exist in your gut “soil” are mostly regulated by your lifestyle. And there’s a ton of evidence indicating that circadian rhythms drive the health of this soil. While I’m not a huge fan of catch-all recommendation, I think it’s safe to say that a diverse microbiome is generally better than one that’s not. But people need to understand what this means. Your microbiome changes throughout the day, it has a circadian rhythm. A bacterial species may be low during the day but increase substantially during the night when it needs to do its job, or vice versa. This can be easily confirmed by taking Ubiome tests at different times during the day. With a diverse microbiome, this means you have a large set of bacteria with diverse functions. The more functions you have, the more likely it is that you’ll see changes based on the time of day, which is the ideal state. For example, if you have poor sleep you may make less melatonin which is processed through the gut. In turn, bacteria that interact with this melatonin may be of lower abundance than is ideal. In terms of environmental factors that people use to address their microbiome, diet is by far the biggest. 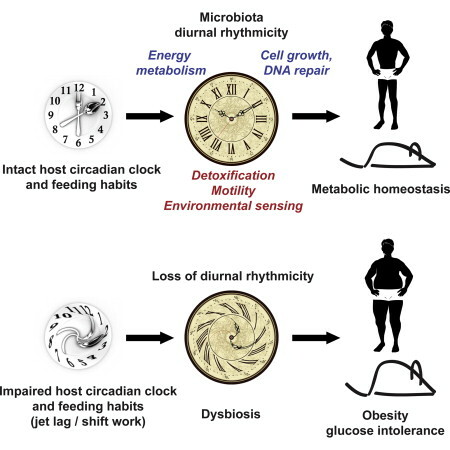 I’m a huge fan of time-restricted eating(TRE), but the feeding/fasting cycle is only one circadian regulator, and there’s evidence that circadian disruption alters how mice respond to time-restricted eating. Disrupting a circadian gene in the liver in mice not only caused them to lose less weight than normal mice, it changed how their microbiome responded to (TRE). This really isn’t surprising given how the liver and gut communicate to regulate the microbiome, but it’s a stark reminder that anyone looking to optimize gut health or their microbiome needs to address their lifestyle, particularly their circadian rhythm. Circadian rhythms fine tune our physiology to successfully interact with the environment. Environmental signals that help set our circadian rhythms, called zeitgebers, cause us to secrete hormones and other factors that allow our organs and tissues to communicate with one another to efficiently carry out biological functions. For more on these zeitgebers, check out this blog. Any organ or tissue regulated by the autonomic nervous system is slave to circadian rhythms, and thus the environment. The autonomic nervous system regulates all automatic processes in the body, including digestion. This runs the gamut from motility, to digestive enzyme synthesis and secretion, to absorption, and yes, the microbiome. We produce a number of different hormones and proteins that help translate these environmental cues in to biological action. Melatonin, cortisol and insulin are a few of these hormones that most are familiar with, but there are more. These include vitamin D, bile and bilirubin. When our skin is exposed to the Sun, we produce vitamin D from cholesterol. It’s not too difficult to see how this can promote a circadian rhythm given that the Sun goes down and this process stops at some point every day. But most people don’t appreciate how important this is for regulating gut function and the microbiome. Vitamin D regulates toll-like receptor expression. Toll-like receptors(TLRs) identify bacteria in the gut that shouldn’t be there and cause inflammation. When vitamin D is low, expression of these toll-like receptors is increased and this makes the gut more sensitive to these bacteria, causing inflammation. It’s important to keep in mind that bacteria needn’t be alive to induce inflammation via TLRs, and most of our food contains dead bacteria with proteins that can trigger TLRs. Thus, a gut that is more sensitive to bacterial components such as lipopolysaccharide is generally more sensitive to food. Vitamin D may also play a role in inducing antimicrobial peptides and promoting immune tolerance, supporting the idea that adequate vitamin D is important for proper immune function. Vitamin D also plays multiple roles in regulating bile, another important factor in regulating circadian rhythms. Vitamin D may inhibit bile production and altering the bile acid composition of bile. Furthermore, the vitamin D receptor helps in the processing of toxic secondary bile acids that can damage the gut and liver. These relationships between vitamin D and bile help link the day/night cycle to the feeding/fasting cycle, two of the more important zeitgebers for setting your circadian rhythms. Bile is an incredibly important fluid that most people associate with digestion and absorption of fat. But bile actually plays a much larger role in our gut that covers far more than fat absorption, including regulation of the microbiome. It’s important to note that there are actually 2 components of bile we need to address here, bile acids and bilirubin. We’ll discuss the former first followed by the latter. Note: I comprehensively covered bile in a previous blog you can find here. This paragraph will function as a review of that blog. Bile acids regulate the microbiome in a number of ways. First, the ability of bile acids to emulsify fats makes them effective anti-microbials. All plasma membranes are made of a fatty bilayer, and when bile acids contact this fatty bilayer it disrupts it leading to cell death. Our mucus layer protects us, but bacteria aren’t so lucky. Fortunately, this doesn’t have a negative effect on many of our commensal bacteria. Many of the commensal bacteria that would come in to contact with bile acids have genes that make them bile tolerant. Thus, if you think about it, in addition to crowding out the bad guys by killing them, bile acids also promote the good guys by creating an environment that gives them a leg up on pathogens. Finally, bile acids help prevent bacteria, even beneficial ones, from overgrowing in areas they shouldn’t. 95% of bile acids circulate through the small intestine and get reabsorbed in the ileum before they reach the colon. This is important for 2 reasons. First, if enough bile acids reach the colon they’ll pull water in to the colon and cause diarrhea. This is believed to be a common cause of diarrhea in people, including those diagnosed with IBS-D. Second, when bile acids bind to their receptors in the ileum they cause the release of antimicrobial peptides(AMPs). These AMPs even work on commensal bacteria because the ileum is so close to the colon, which houses the vast majority of bacteria in our gut. This process is important for preventing small intestinal bacterial overgrowth(SIBO). Bilirubin, another component of bile, was often thought of as a toxic byproduct of heme degradation that leads to jaundice. When our red blood cells are destroyed, biliverdin, iron, and carbon monoxide are released and biliverdin is rapidly converted to bilirubin. It wouldn’t make sense from a physiological standpoint to convert biliverdin to bilirubin since biliverdin is not toxic but bilirubin can be. Thus, bilirubin must serve some physiological role, which I covered in a blog you can find here. Evidence has piled up showing bilirubin and its metabolites to be important antioxidants capable of preventing lipid peroxidation, the process by which free radicals damage lipids such as the plasma membrane surrounding your cells and low-density lipoporoteins(LDL). This may be a fairly important route for the accumulation of the plaques that lead to atherosclerosis. On an interesting note, people with Gilbert Syndrome, which causes mildly elevated bilirubin levels, are protected from a host of problems including atherosclerosis, non-alcoholic fatty liver disease, obesity, and Type 2 diabetes. Recently, a lot of attention has been given to bilirubin as a major factor connecting many aspects of the circadian clock including regulation of the microbiome. It’s been known for years that bilirubin reacts to light. Jaundice in babies is remedied by exposing their skin to light, and there’s evidence that exposure to light causes bilirubin to be converted to a number of metabolites with diverse antioxidant functions in adults. Interestingly, the wavelength of light that induces this conversion of bilirubin to its less toxic antioxidant metabolites is the blue wavelength, the same wavelength that helps set our master clock when it hits the eye. The other primary route of bilirubin removal is via conjugation in the liver and dumping in to the gallbladder in bile with bile acids. Thus, bilirubin also connects the master clock regulated by light with the peripheral clocks in the liver and gut, regulated by the feeding/fasting cycle. A recent review covers the many ways that bilirubin impacts the gut-liver axis and thus, the microbiome. When we consume food and it enters the small intestine, the gallbladder contracts and releases bile which contains bile acids and bilirubin. Bacteria throughout your gut interact with bilirubin, changing it in a number of ways. While we aren’t certain on the particular strains, we do know for sure that bacteria act on this bilirubin as it’s this bacterial action on bilirubin that gives feces its brown color and urine its yellow color. A lack of these bacteria or bilirubin leads to stool or urine that is either pale or clear, respectively. In the colon, commensal bacteria deconjugate bilirubin, allowing it to be reabosrbed. Unlike bile acids, bilirubin is meant to enter the colon. In fact, the colon is where most of the transformation of bilirubin occurs, including the “browning” of your feces. Like Vitamin D, bilirubin plays a role in the detoxification of toxic secondary bile acids. When bilirubin enters the colon, it activates the constitutive androstane receptor(CAR) which promotes this process. This isn’t necessarily an altruistic task, as it’s meant to detoxify bilirubin after bacteria deconjugate it, but it significantly contributes to our ability to process bile properly. Bilirubin also links a few other aspects of our circadian physiology. One of the major routes of heme degradation due to red blood cell rupture comes from physical activity. Red blood cells rupture under mechanical stress, and this occurs both when our muscles contract and our foot strikes the ground. In fact, most of the increase in heme breakdown that comes from running is caused by footstrike hemolysis. Bilirubin may also play a role in sleep architecture and depression. Animals who don’t make bilirubin don’t experience REM sleep and animals who do make bilirubin vary in the amount of REM sleep they get in proportion to the amount of bilirubin they produce. Finally, human population data shows that the amount of REM sleep a population gets is associated with bilirubin levels which are, in turn, associated with the amount of light they’re exposed to during the day. This could, in turn, affect seasonal affective disorder. In a previous blog, I discussed the importance of physical activity for bile release. This is one of the primary reasons that adequate physical activity is crucial to overall health, but gut health in particular. I cannot make this point enough: You cannot experience good health as you age without making sure you get adequate physical activity. I’ve been emphasizing this point with people in my Circadian Retraining Program recently, and the people jumping on the bandwagon and following the protocols are seeing incredible results. On the circadian side of things, cardiovascular exercise increases the number of mitochondria you have, and not just in your muscles, throughout your entire body. This allows every tissue to have adequate energy, but also helps regulate gene expression. The result: decreased brain fog, improved sleep, decreased fatigue and…most importantly…improved gut function. But how does this help with gut function outside of improved bile flow? Generally speaking, physical activity improves motility big time. But that’s not the only benefit. More than 20% of the species diversity in your gut can be attributed to cardiorespiratory fitness(CRF), measured as VO2 max(The maximum amount of oxygen your body can consume). The best part is we can actually measure CRF on our own now and see how it affects things like our sleep and autonomic tone. This helps immensely with compliance and motivation. The higher your VO2 max, the greater the abundance of butyrate-producing bacteria. This helps maintain a nice, tight gut and also helps with gene expression as butyrate is an HDAC inhibitor. The reason VO2 max is so important is because it’s a measure of our capacity to create energy in the presence of oxygen. This solely takes place in the mitochondria, so people with a low VO2 max have a low number of mitochondria. Fortunately, properly programmed exercise can significantly increase VO2 max, and we can measure this. This has been an important aspect of getting buy-in for people in Much of the crosstalk between microbes in the gut and our cells occurs with the mitochondria, likely an artifact of the bacterial origins of our mitochondria. For example, butyrate is used as energy by enterocytes, the cells that line the gut wall and only occurs in the mitochondria. Thus, low mitochondrial number means our enterocytes don’t get the signals our microbiome sends, and can increase the leakiness of the gut, something most readers of this blog would like to avoid. So even if you consume enough fiber in an attempt to promote the presence of butyrate-producing bacteria, a lack of mitochondria in enterocytes likely prevents this from happening and promotes leakiness. This is why we need to manipulate more than our diet, communication is a 2-way street. Lifestyle is king when it comes to gut and overall health, but you can’t focus solely on diet. Anyone interested in optimizing either should put the bulk of their efforts in to modifying their entire lifestyle, particularly their circadian rhythms. While playing around with pre- and probiotics may provide modest benefit, creating the proper environment for healthy bacteria to grow requires a lot more effort than popping a pill or a powder. Environmental conditions in the gut are dependent on many circadian factors including melatonin, cortisol, insulin, vitamin D, bile acids, bilirubin, and much more. These factors are all known to be regulated by the zeitgebers that regulate the circadian clock, and there are certainly more to be discovered. The microbiome itself has a circadian rhythm, and the above factors appear to play major roles in regulating the microbiome rhythm as well. An interesting aspect of this concept is how many of these hormones and proteins seem to be affected by multiple zeitgebers and promote intercommunication between many systems in the body. Bilirubin may be a chief example of this concept given its diverse roles and regulation by many zeitgebers. Thus, for proper circadian rhythms, when we are exposed to these zeitgebers may not be the only important aspect of circadian rhythms we need to be concerned with. We may also need to focus on how they’re layered in relation to one another throughout the day which regulates output of the above. We also have to make sure we get adequate physical activity, which promotes proper communication between us and our resident microbes.